ManyBass is a bass guitar sample based synthesizer which comes with a large collection of bass guitar samples intended to form the foundation of your day to day bass instrument needs. This extensive range of sounds has then been coupled with a highly efficient sample playback engine with a powerful FX rack. 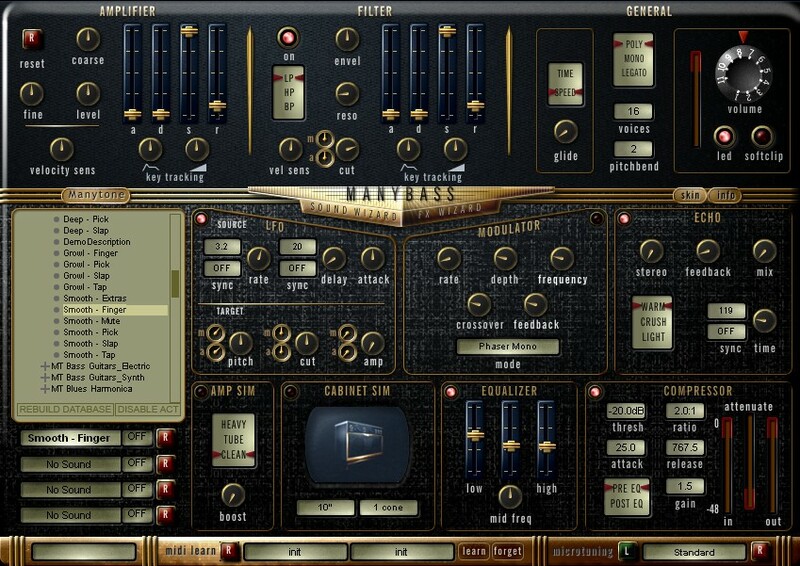 ManyBass was designed and built by ManyTone and AraldFX. ManyBass has been designed to provide you with a high quality sound, thanks to the included 2.4 gig of all-new 24 bit, electric bass guitar multi-samples that extensively cover various articulations and playing styles of the real instrument. Click here for a full soundset listing. The engine and onboard Amp Sims and FX were designed and tuned for bass type sounds, including the playback of real bass guitar instrument samples. The included Presets, along with the Sound and FX Wizards, will have you creating realistic sounding bass guitar tracks in no time at all. Along with the included electric bass guitar samplesets, ManyBass also comes with a selection of Waveforms that are capable of producing synth bass type sounds as well as other synthetic instrument sounds. ManyBass will allow you to load up to 4 different articulations of an instrument and switch between these articulations using simple Keyswitching or Midi cc. The 2.4 gig of bass samples included were all recorded from the same bass guitar, and then mapped into 13 individual soundsets. This keyswitching feature allows the user to load up to 4 of the soundsets and easily switch between them using a Midi note, or a button on your keyboard controller. All this is accomplished on a single page, in an easy to use, graphical user interface. ManyBass is available in PC VSTi format and Mac AU and VSTi formats (Universal Binary). 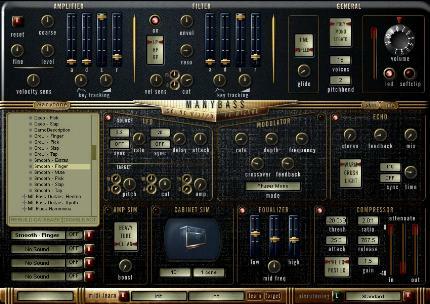 ManyBass is available in PC VSTi format and Mac AU and VSTi formats (Universal Binary). One license covers both formats. These prices are for Downloadable versions. DVD shipped via airmail - add $20.00 Please email us for the link to purchase shipping. Here is the link to try out ManyBass before purchasing. NOTE - It can take up to 24 hours to receive your download link. It is usually much quicker though. See the FAQ on our Contact page for more info. Click here for a full size image of ManyBass. So how are ManyBass and ManyGuitar different? ManyBass has 2.4 gig of new Bass Guitar Samples. Also, as ManyTone has already released 3 Bass Sample packs available separately, we wanted an instrument that specialized in playing these type of sounds. ManyGuitar contains 1.2 gig of samples that includes both guitar and bass samples. In the future you can expect to see ManyGuitar develop into a stronger guitar based instrument, with additional features and sounds geared towards acoustic and electric guitars. The two products are different, so you really owe it to yourself to own both!! Here are a few audio clips to give you an idea of the sort of sounds you can expect from ManyBass. These were all made using ManyBass sounds: there has been no external processing. In designing ManyBass the focus has been on detailed and highly playable sounds - this is the same for all Manytone instruments. Most of the soundsets include over 130 multi-samples for stunning levels of detail, with special layers (such as slides, harmonics, string noises, and mutes). Add to this the fact that ManyBass allows you to load up to 4 different soundsets, selected via keyswitching, so you will have an extensive range of sounds available at your fingertips for instant playing or sequencing. ManyBass will also load soundsets in both Wusik wusikSND and Dash Signature dashSND format. This means that as well as the libraries that are already available for WusikStation from Wusik and EVE from Dash Signature, all of the existing ManyTone soundsets can be loaded into ManyBass to take advantage of the amplifier/cabinet treatments as well as the well stocked FX rack. Of course, the ManyBass soundsets can also be loaded into other products that use the wusiksnd sound format. Click here to read more about the soundsets. As well as the soundsets, there are many presets produced by professional sound designers, including Greg Schlaepfer, Manytone, and others. These presets along with the included Sound and FX wizards, provide an endless variety of sounds and styles you can call up with only a few mouse clicks. ManyBass is skinnable and other skins will be available for free to all users. Check back here soon to see these new skins. What are the minimum specifications for my computer? 256 MB of RAM as the absolute minimum - 512 MB is acceptable and 1 gig or more is preferred if you wish to layer and keyswitch the larger soundsets.